Autogeek in Paradise 100% Cotton Screen-printed T shirt: Relax in style with surf, sand and Autogeek! Sun, surf, sand, and Autogeek! Back in the 1950’s and 60’s, cars and the beach went hand in hand. Images of sports cars cruising a seaside highway or overlooking the beach are still popular in car ads. Coastal towns all over the country host their own muscle car shows to commemorate this special time in the history of the American automobile. The Autogeek in Paradise T-shirt captures the magic of cars and the coast with a colorful beach-inspired design. Of course, we put a modern twist on the traditional scene by including a 2007 Corvette C6 in Velocity Yellow overlooking a picture perfect sunset. On the front breast pocket is a coordinating logo of the Autogeek cruising with the top down. 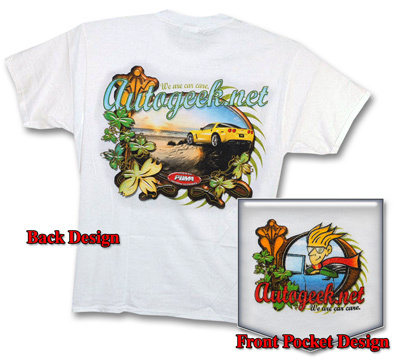 Relax in this shirt and you’ll feel like an Autogeek in Paradise, too!